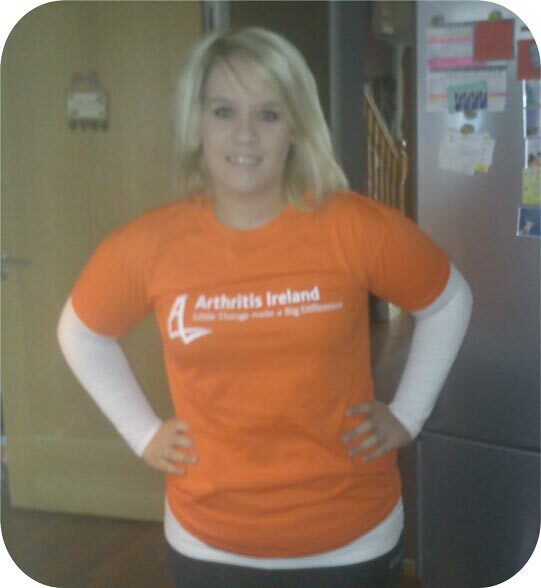 Making it count: Paying tribute to a loved one with arthritis by raising funds for Arthritis Ireland. When Anna Nolan-Pang was invited to speak at Arthritis Ireland’s JA Family Day for children with arthritis, the visit was an eye-opener for both her and her husband Jonathan. Having been diagnosed with JA at the age of two, Anna, from Dundalk, grew up without access to many of the supports and services provided by Arthritis Ireland today. 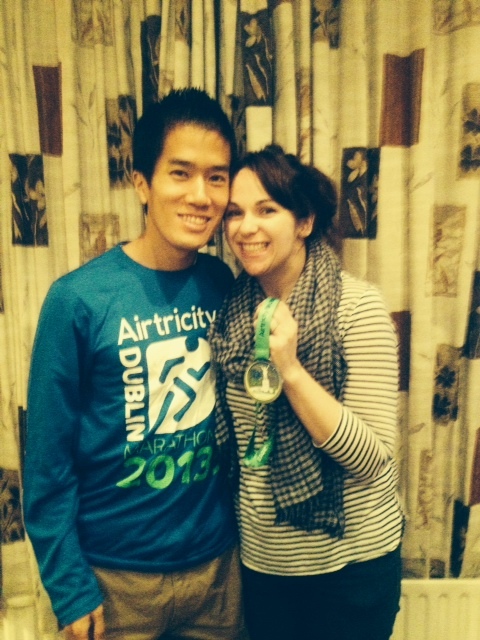 Last year, she stood proudly at the finish line as Jonathan completed his first Irish marathon, a feat which raised €400 to go towards badly-needed support services for Arthritis Ireland. And the couple’s visit to a JA Family Day was a chance to see where some of that money is being spent. Anna’s condition deteriorated throughout her teens until she had both hips replaced at the age of 22. Yet it didn’t stop her from jetting off to college in California where she first met Jonathan. After tying the knot in August 2012, Anna and Jonathan initially settled in California but have since returned to Anna’s home in Louth. And a major factor in their move was the medical and practical support available for people with arthritis in Ireland. Inspired by his wife’s positive attitude and the easily accessible support offered by Arthritis Ireland, Jonathan came up with a plan. The keen runner signed up for last October’s Dublin City Marathon, raising funds for Arthritis Ireland along every step of the 26.2 mile course. The experience taught him a lot about the generosity of the general public. “No one likes to ask for money but when I started fundraising I quickly noticed how generous people here are when it comes to supporting charities”, he said. *Arthritis Ireland would like to say a BIG thank you to Jonathan for his generous support and congratulations on completing his first Irish marathon! Do you have a family member or friend willing to raise funds in honour of people with arthritis? Choose your own special challenge, whether it’s a triathlon, a walk, a skydive or something completely different. 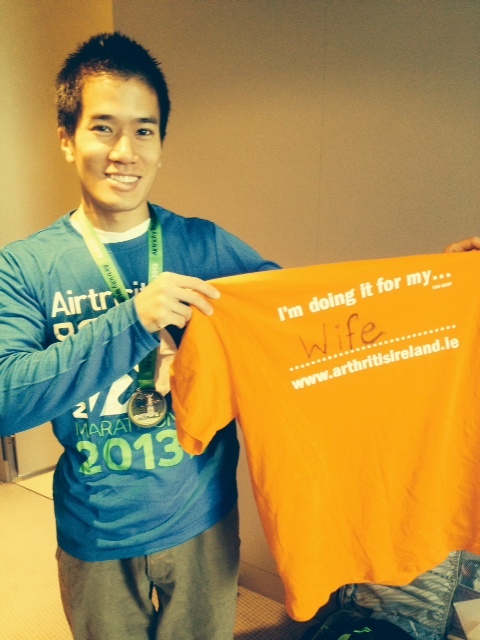 Register with Arthritis Ireland here and receive your “I’m doing it for my …” t-shirt as well as tips for successful fundraising. Reach out to your family and friends – in person and online – and invite them to support a worthy cause. Enjoy the event and return the funds to Arthritis Ireland where they will be used to fund our work in branches all over the country. Register for the Dublin City Marathon here today. Register for another physical challenge around the country here today. I’m writing to update you all on our medical card campaign, to thank you for the extraordinary support we’ve received so far and to urge you to continue fighting for people with arthritis by making your own submission on medical cards to the HSE. Over the last month, I’m happy to report real progress. Having been inundated with calls and emails to our helpline, a great movement of people with arthritis has grown, gathered momentum and prompted a change. 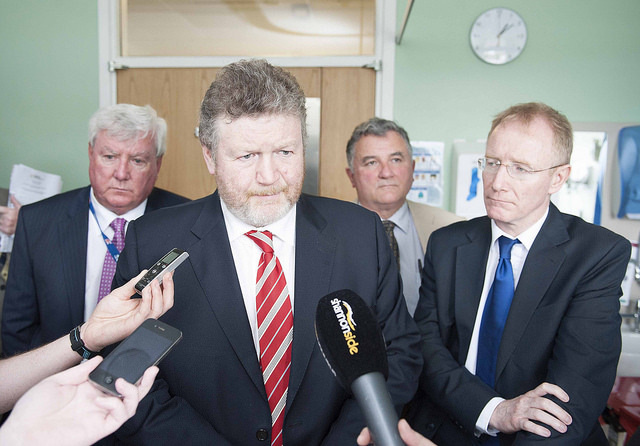 This pressure culminated in an emergency meeting with the Minister for Health James Reilly last week, at which he apologised unreservedly to me for the scandal and promised me that he would fix the system so that medical cards are awarded on medical grounds too. It all started thanks a phenomenal response to our survey three weeks ago which meant we were the only patient organisation able to present Minister Reilly with comprehensive data on the impact of the medical card scandal on our community. I would like to say a HUGE thank you to everyone who took part in this survey. Having this data really strengthened our negotiating position with Minister Reilly and allowed us to feed the media’s appetite for proper statistics on the medical card issue. Being the only patient organisation to conduct a survey meant that the media were quick to cover our side of the story and we secured great coverage across print and broadcast media. Here are just a few samples: RTE News, Irish Examiner & Irish Independent. We also conducted a cost analysis where we found that the added financial burden on a person with inflammatory arthritis was on average more than €5,500 per year, of which €3,500 is covered by a medical card. And in the case of juvenile arthritis, the average cost on a family was more than €7,000 per year with the medical card covering €3,500. Costs covered by the medical card include medication, GP visits, blood tests, vaccinations, orthotics, eye tests and podiatry. Additonal costs not covered by the medical card include hospital travel expenses, private physiotherapy and occupational therapy, splints, sun cream and additional heating costs. All of these figures, combined with the human stories of people who have lost their medical cards, allowed me to make a compelling argument to Minister Reilly as to why people with arthritis on expensive medical treatment should be in receipt of a medical card. 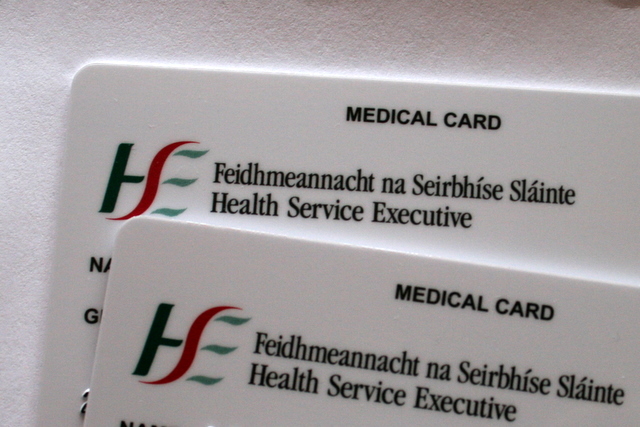 As mentioned above, Minister Reilly accepted that people had their cards unfairly withdrawn and said he was determined to introduce a system that will award medical cards based on medical need. I also asked him to consider the views and feedback from patients and patient organisations, like Arthritis Ireland, on what conditions should be included on the new system and he confirmed that he would. With this in mind, the HSE are now taking public submissions on what conditions should entitle a person to a medical card. This is your opportunity to explain to the HSE why people with arthritis, who are forking out for expensive medical treatment every month, should be automatically entitled to a medical card. The application is simple, you can do it by post with this form here or online here. Arthritis is often described as an invisible condition; this is your opportunity to let the HSE know the massive impact it has on your life. By filling out the submission at the link below you can make a big impact on the HSE’s decision to ensure that arthritis is on the list of illnesses that are covered. Read our submission to the HSE here. Click here to fill out the form online now or for more information, please call our helpline on 1890 252 846. Thanks again for your support. Change does not happen without your voice. Arthritis Ireland is today expressing its deep concern at the number of people with arthritis who have lost their discretionary medical cards in recent months. In a new survey, conducted by the charity, 60% of people with arthritis who have or had discretionary medical cards admitted they had been taken away or placed under review. The charity is now calling on the Government to make good on their pre-election promises and take action to resolve this ongoing scandal. It is also urging the HSE to ensure arthritis patients on expensive treatments, such as high-tech biologic therapies, are given medicals cards straight away. Arthritis is the single biggest cause of disability in Ireland, affecting almost one million people from newborn babies through to the elderly. There is no cure so regular medical treatment is vital to keep the condition in check to prevent permanent joint damage and disability. 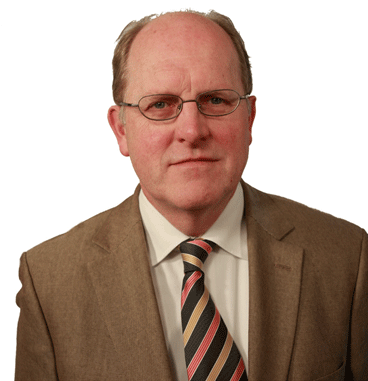 Arthritis Ireland CEO, John Church, said: “Although the Government has stated that there is no policy to cut discretionary medical cards, the results of our survey suggest otherwise. “People with arthritis already face significant challenges living day-to-day with the severe pain and fatigue of arthritis and it is inhumane to place them under further financial hardship and distress by taking away their medical cards. “We are particularly concerned for families of children with juvenile arthritis as more than three quarters have had their cards placed under review or taken away. Parents are already facing totally unacceptable waiting list times of over 18 months to see a rheumatologist, despite the guidelines recommending a maximum of 4-6 weeks. Arthritis Ireland has a full breakdown here of what people with arthritis need to do in the event of their medical card being taken away or placed under review. The charity’s National Helpline (1890 252 846) is also there to help people who are experiencing difficulties with their medical cards. WHEN an arthritis flare-up leaves you feeling sore, stiff and miserable, the temptation to curl up on the couch can be hard to resist. But as the members of Arthritis Ireland walking groups have discovered, moving really is the best medicine. Elaine Cullen certainly agrees. 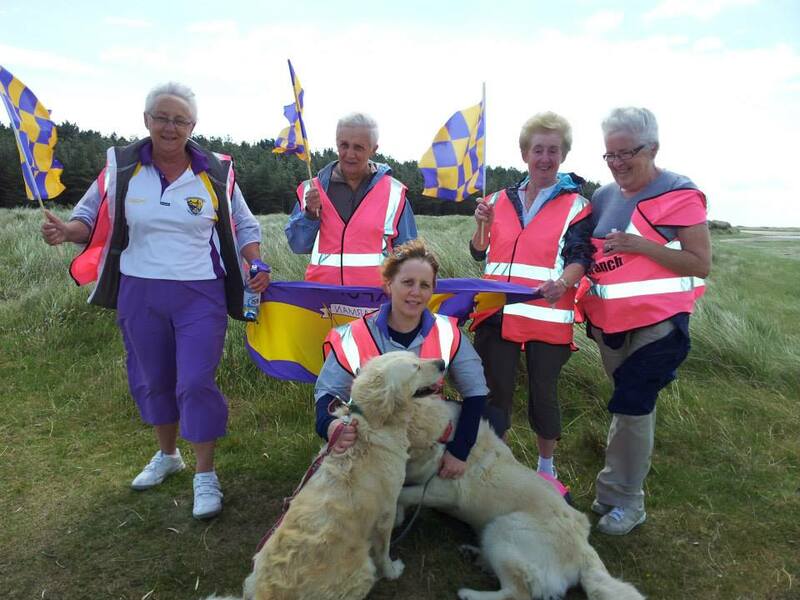 The 32-year-old is a proud member of the Wexford branch’s “Pink Ladies”, one of the network’s most vibrant and committed groups. Having been diagnosed with fibromyalgia and osteoporosis five years ago, Elaine’s condition became so severe that she struggled to walk and was even forced to give up work. However, things changed when she joined the Wexford Walking Group, a development she describes as “like taking a magic pill”. Yes, while walking is the main pursuit, the post-walk bonding over a cuppa is an equally effective tonic. 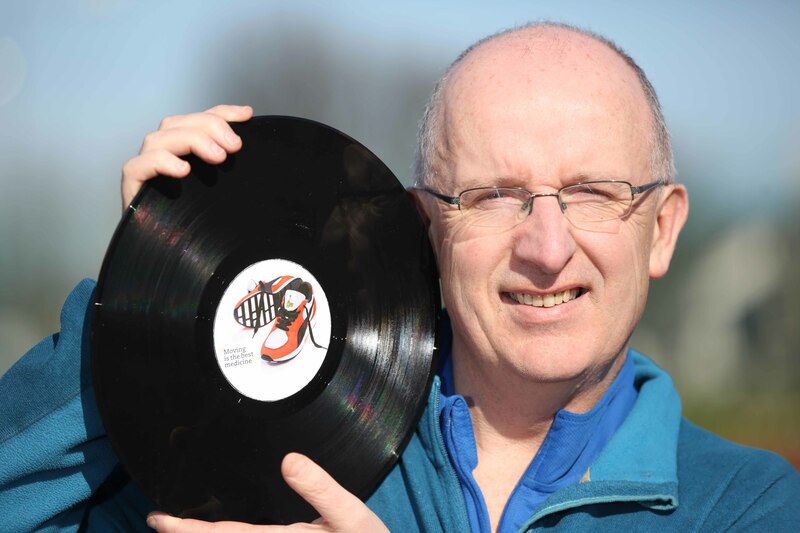 It’s now three years since Rosaleen Finnigan and Phil O’Mahoney set up the group. And both women know all about the importance of keeping active thanks to personal experience. Rosaleen, 66, copes with an unenviable combination of rheumatoid arthritis and osteoarthritis as well as fibromyalgia. And she remembers only too well the shock of her diagnosis. “The worst thing was the isolation. I had to give up work and depression set in. My husband would get me out of bed in the morning, put me in a chair and I’d be there when he came home”, she said. Determined to manage her condition – and to help others do the same – Rosaleen got involved in the Wexford branch of Arthritis Ireland and trained alongside Phil as a walking group leader. 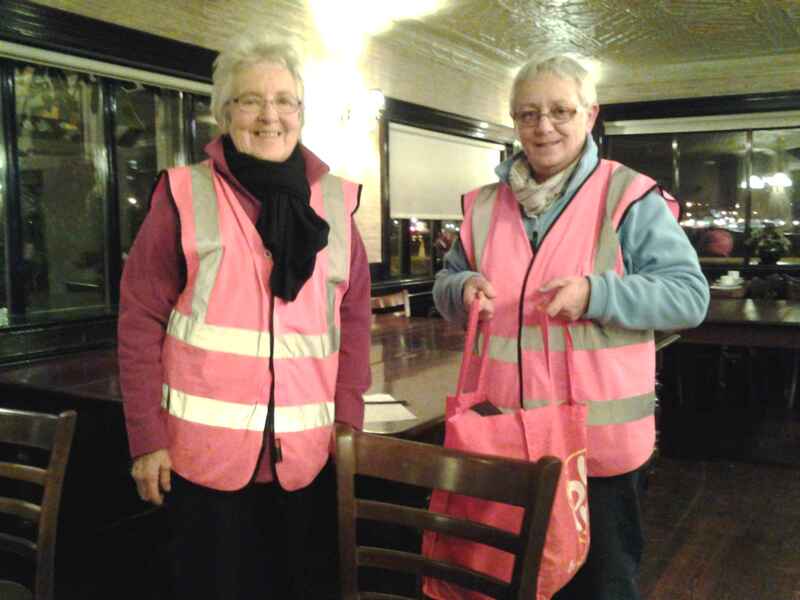 Hail, rain or shine, the determined ladies now meet every Wednesday evening at the River Bank Hotel in Wexford where they embark on a 40-minute walk. As they cater for walkers of all abilities, co-founder Phil insists there’s “no entry criteria”. The group’s weekly route varies depending on daylight, but its philosophy of safe and healthy exercise in a supportive atmosphere remains the same. And the enthusiastic members are all united in their belief that it’s a case of reaping what you sow. Arthritis Ireland’s network of arthritis-friendly walking groups spans right across the country. Find out where your local group is by clicking here or call 1890 252 846. Would you like the chance to lead your own walking group? Find out how here. I have been training since last November, shortly after I got out of the hospital and back on my feet. It was very hard as I was in constant pain and as my new medications were still quite new and hadn’t kicked into the body properly, it took a little adjusting. I was careful to take it easy and to really take one step at a time so as not to do too much. I found that the little things that I was doing were making a big difference. For the past few months, my training has been back to full swing concentrating on strength, high resistance and cardio. I am training for the Mini Marathon with my friend Emma and sometimes other friends join us. Training together helps make us stronger and pushes us to reach our own personal goals. At the moment my training usually consists of 10km runs, cross training, arm strengthening, Tae Bo, some tennis and more. I try to work out up to 6 days per week if I’m not sick and I usually take one rest day per week. In the past 2 weeks I haven’t been able to train every day or stick to my sessions with the other people I exercise with as I had ongoing migraines and was feeling constantly sick. I also had joint pain that flared in my arms and knees. I stopped training for a couple of days but tried swimming instead. I got back training again for a few days but had to stop due to the pain I was feeling. It is not only the pain that was affecting me, but also I am in college at it is a really busy time at the moment. I had practical exams at the end of March followed by written exams in April/May. Every day is really busy. I try to exercise after college and might not get home until 10pm. With assignments it could be past midnight before I am finished. Time management is really important as sometimes I feel like I should exercise but I know that my college work will suffer. If I chose my assignments, then my training will suffer. I have to work hard at balancing the college work and my fitness. My family tell me that sometimes I don’t know my limits, but they are really supportive of me and what I am doing. Taking part in running events is a really big motivation for me. The first run I did really helped me to reach my personal goals. Since then I have used them as motivation to keep training. I am managing something that I always thought would be impossible. Being active really helps me ease off and de-stress. I also find that things like Yoga really help me. I have really learned that with the correct motivation, everything is possible and I can achieve anything I want. Moving is definitely my best medicine. Here are some helpful tips to help keep you motivated with your own exercise. 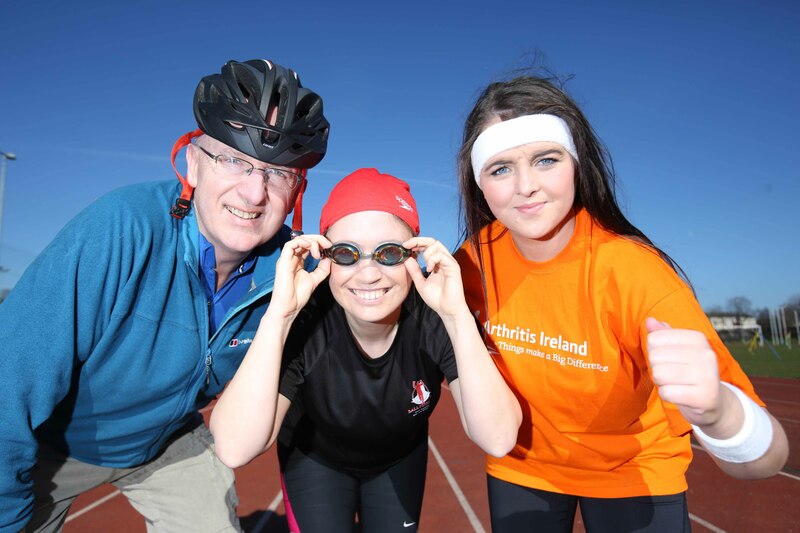 1: Set yourself a goal – Why not sign up to take part in the mini marathon on June 2nd and raise money for Arthritis Ireland. Stick your registration letter on your fridge, or somewhere you will see it every day as a reminder that you are going to do this. 2: Start slowly – Don’t run before you can walk! Why not join an Arthritis Ireland walking group in your area. Build up the intensity and distance of your walks slowly. Seeing your achievements will really motivate you. 3: Get a Training Buddy – Veronica trains with her friend Emma and this motivates them both. Why not make arrangements to exercise with a friend or family member. If you have a “date” with them, you are much less likely to miss your session. 4: Warm up & Stretch – make sure you warm up properly before starting. When you sign up to take part in the mini marathon for Arthritis Ireland, you will receive a full training pack with lots of useful and safe stretches and exercises. 5: Variety is the spice of life – just as veronica changes her routine with different kinds of exercises, try out things like swimming, aqua aerobics, an exercise bike and walking. Find what suits you at a specific time. Swimming can be great when you want to ease the pressure on your joints. 6: Spread the Word – Tell your family and friends what your goal is and why. As them for sponsorship & tell them why it will make a difference. Ask them for their support. You may be surprised at who you motivate to get involved too. To read Veronika’s first post click here. Click here to register your interest or for more information in taking part in the Mini Marathon on behalf of Arthritis Ireland or call Orla on 01-6470209. It’s a tale of two very different patient outcomes. Just a few years ago, a person experiencing symptoms of rheumatoid arthritis (RA) faced a worrying and uncertain future. Long waiting lists for consultants meant delays in accessing appropriate treatment, often leading to avoidable joint damage, expensive surgery and a grave impact on every aspect of a person’s work, social and family life. Fast forward to 2014 and the outlook is brighter. Today, a person developing RA can expect to be prescribed effective treatment within weeks. Thanks to the vast strides made by the HSE’s National Clinical Programme for Rheumatology and the supports and services offered by Arthritis Ireland, people with RA are enjoying healthier lives. 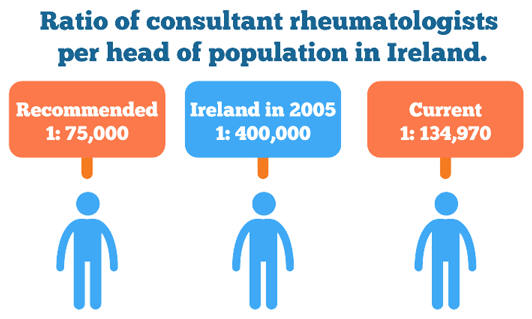 However, although progress has been made in recent years, there’s still a long way to go for Ireland to be recognised as a global leader in rheumatology patient care. As part of the HSE’s National Clinical Programme for Rheumatology, Arthritis Ireland has been working to inform the strategies around improving rheumatology care in Ireland. 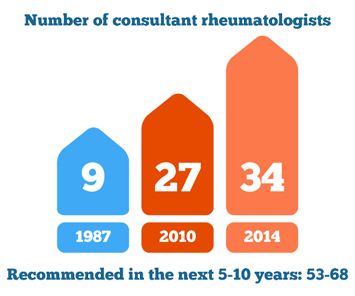 Since the programme’s launch in 2010, seven new public consultant rheumatologists have been appointed, bringing the consultant:population ratio to 1:135,000. This includes the appointment of a second consultant paediatric rheumatologist to Crumlin Children’s Hospital, who is working to treat children with juvenile arthritis. The programme’s clinical lead Professor Oliver Fitzgerald says it’s still not enough, but it’s certainly progress. The new appointments are mainly outside the Dublin region, making life easier for people in areas which were not previously served by a rheumatologist. Another major development has been the appointment of 24 specialist MSK physiotherapists who have so far reduced the orthopaedic and rheumatology waiting lists by 20,000.
we felt that they had issues which were non-inflammatory in nature so they did not require a consultant. It meant that they were seen faster and given the appropriate advice or treatment and the consultants’ time was freed up for inflammatory patients”, said Professor Fitzgerald. Another key aim is the development of an efficient primary care service which will allow more patients to be treated in their local community, avoiding long journeys to hospitals. More nurse specialists will also be needed to deliver the proposed Treat to Target programme which will decrease the chance of the condition progressing by reducing a person’s Disease Activity Score. Undoubtedly, there’s a long road ahead for rheumatology services in Ireland, but it’s clear the journey is well underway. 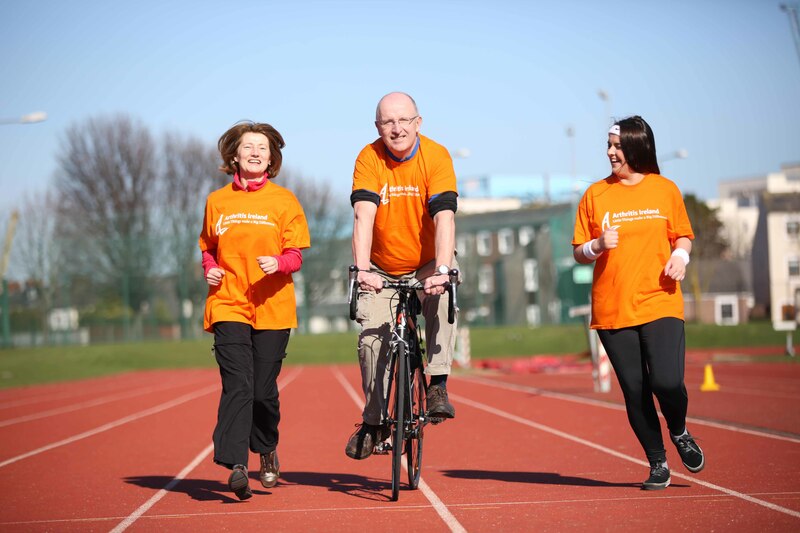 As well as advocating for better healthcare services, Arthritis Ireland’s Living Well with Arthritis programme has empowered thousands of people to play a more active role in managing their arthritis. The organisation is also funding two dedicated Chair of Rheumatology research posts which will lead to new, more effective treatments. And its work with the Irish College of General Practitioners has helped educate GPs to recognise and respond to the early symptoms of arthritis. This article is taken from Issue 5 of Arthritis Ireland’s Big News magazine. You can receive this magazine by Becoming a Friend of Arthritis Ireland.Become a Friend Now.